Leads 2 Business has recently been the target of a scam. Whereby the company Tzeen General Traders has attempted to masquerade as "Leads to Business". The have emulated our company letterhead on their emails, as well as provided our Johannesburg Sales office, as their business address. We wanted to Alert you to Protect you! We have emailed all our active clients registered on our database to warn you of this rogue. This page is intended for those who perhaps did not receive the email or who have been contacted by this company. The company trying to masquerade as us is using the domain leads2business.org.za or more specifically the address tenders@leads2business.org.za. WHAT DOES THE CONTENT OF THE EMAIL SAY? We have done our utmost to eliminate this activity by leveraging our TradeMark Leads 2 Business, however without a contactable address for this organisation they remain cyber criminals. Unfortunately, there is no guaranteee that this type of company will not re-appear again under yet another alias that copies a legitimate business. While we cannot prevent this, it is our hope that as this information comes to our attention we will be able to alert you in sufficient time to protect your business from fraudsters such as these. Please be careful online, don't become a victim of fraud. 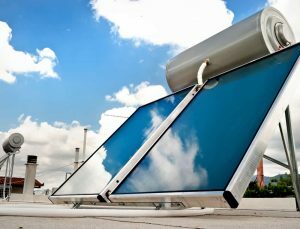 Why the B-VLV300L SOLAR GEYSER? Tzeen General Traders are the only company that comes up for this particular product and it is a means for them to generate fraudulent revenue. In a direct solar system, the water is heated by circulating water from the storage vessel through the solar panels. This can be done naturally via thermo-syphon or by a pump. The system is simple and cost effective however it must be noted that the pressure in the storage cylinder will be transferred to the panel which makes this unsuitable for some panels. Should this system be selected in areas of consistently low temperatures (-0°C) in winter i.e. Sutherland and mountainous areas such as Drakensburg, Maluti and other cold areas, there are simple ways in controlled systems to stop panel freeze. In coastal regions and most other parts of South Africa, direct systems are highly suitable without the need for freeze control. Whether or not a panel freezes also depends to a large degree on the panel quality i.e. insulation, air gap etc. Furthermore, the integrity of the installation, the insulation of the pipes – particularly copper pipes etc. could be responsible for the system freezing. A direct system should not be installed in areas where the water contains high levels of dissolved solids. Depending on the severity of the problem the panel could get blocked up in a short period of time, rendering the whole system ineffective. In a direct system the geyser has no influence on the performance of the system, other than the temperature provided by the electric element as a back-up, since it functions purely as a hot water storage tank. Diameter – 510 mm ø.
Fitting Sizes – 19 mm / 3/4″ BSP. Boiler Material – 2.0 mm Steel. Casing Material – 0.5 mm Galvanised Steel. Corrosion Protection – Approximately 3.0mm PEX. Water Conditions – Suitable for all water types. Maintenance Intervals – Maintenance Free. Insulation – 30 mm of centre Polyurethane foam. Electrical Back up – 2 kW Element and adjustable thermostat. Diameter – 550 mm ø. Maintenance – Intervals – Maintenance Free. 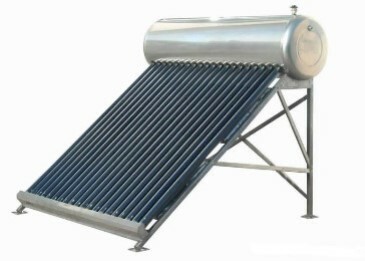 Operational Use – Suitable for thermosiphon or pump (active or passive). Insulation – 60 mm of centre Polyurethane foam. Additional pocket optional control probe – STD. Orientation – Horizontal or Vertical (Please call in if Vertical Orientation is required as Horizonatl is default). Safety Valve Operating Temperature – 93 °C – 98 °C. Heat Loss – < 2.91 kW/24Hrs.